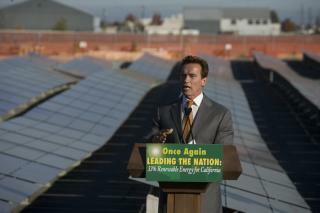 California Governor Arnold Schwarzenegger on Monday terminated talk that the recession will crimp California’s fight against global warming when he ordered every utility in the state to obtain a third of its electricity from renewable sources by 2020. And in a move that will shake up the land rush to build solar power plants in the desert, Schwarzenegger signed an executive order to streamline and prioritize the licensing of such projects. California currently requires the state’s Big Three investor-owned utilities – PG&E (PCG), Southern California Edison (EIX) and San Diego Gas & Electric (SRE) – to secure 20% of their electricity from green energy sources like wind, solar and geothermal by 2010. Monday’s move turns what had been a 33% renewables goal into a mandate and extends responsibility for meeting it to every electricity retailer in California. Utilities, however, have struggled to reach even the 20% target as renewable energy projects become bogged down in California’s extensive environmental review and licensing process that involves a host of state and federal agencies. Many proposed massive megawatt solar power plants will be built on environmentally sensitive land in the Mojave and Colorado deserts in California, threatening to trigger years-long battles over endangered species and water. Take, for instance, the Ivanpah Solar Electric Generating System, 400-megawatt solar thermal power plant to be built by Bay Area startup BrightSource Energy on U.S. Bureau of Land Management property. BrightSource, which has a 20-year contract to sell the power plant’s electricity to PG&E, is dealing with the California Energy Commission, the California Department of Fish and Game, the BLM and the U.S. Fish and Wildlife Service as well as the agencies that control access to the transmission grid. Then there’s environmental fights over extending power lines to connect such projects to coastal metropolises. Late last month, state regulators rejected San Diego Gas & Electric’s plan to build $1.3 billion transmission line called the Sunrise Powerlink due to the environmental impact of routing it through sensitive desert lands. A final decision on the project to bring green energy from the Imperial Valley to coastal metropolises will be made next month. Schwarzenegger’s executive order requires various state agencies to collaborate to create a one-stop shopping permit process to cut in half the time it takes to license a renewable energy project – which now can be a two-year slog. The U.S. Fish and Wildlife Service and BLM also agreed to participate in a Renewable Energy Action Team to expedite the licensing of solar power plants and other green energy projects. By March 1, the action team will identify and prioritize those areas of the desert that should be developed first for renewable energy projects based on environmental impacts and access to transmission. The group will also work with another task force that is identifying where power lines should be extended into the desert. That will affect the fortunes of dozens of solar startups, financiers and speculators — everyone from Goldman Sachs (GS) to Chevron (CVX) — that have filed lease claims on nearly a million areas of desert land that the BLM is opening up for solar power plants. Those with land claims in areas at the top of the list for renewable energy development will find it easier to obtain financing – currently in short supply – to build billion-dollar projects. Those at the bottom of the list may rue the six-figure application fees they paid to stake claims on thousands of acres of desert land. Behind the optimistic talk and smiles at Monday’s press conference, utility execs and environmentalists who praised the governor’s latest green initiative also signaled that political fights over how to achieve the state’ ambitious renewable energy goals are not over. But when the Nature Conservancy’s Rebecca Shaw took the microphone, she offered a cautionary note. “In our urgency to create a more sustainable future, we must be careful not to destroy the very environment that we are trying to protect,” said Shaw, associate state director for the environmental group. California’s aggressive renewable energy policies already have had one desired consequence: spurring the creation of green collar jobs. OptiSolar, which earlier this year signed a long-term contract to supply PG&E with 550 megawatts of electricity from a massive photovoltaic solar farm, employs 500 people at its Bay Area headquarters and factory. CEO Randy Goldstein said his company will hire another 1,000 for its new Sacramento factory. As a Green Architect I say its about time and way long over due! I also suggest you read the posts from the blog and check out the Inside Renewable Energy podcasts.